The post-2008 political landscape in Europe has been littered with public discontent and protest. In Spain and Greece this has manifested itself in revolt against the European establishment and a refusal to be bound by the financial practices of the past. In England, immigration has raced to the forefront of the political agenda, while in Scotland and Catalunya nationalism has come to the fore in a way that would have been unimaginable only a few years ago. In France the National Front has eroded support for the rightwing UMP while simultaneously appealing to much of the working class. Even Germany has not been immune to an element of political unrest. Although the principles underlying these movements may differ greatly, it would be foolish not to wonder if there is a common denominator running through European protest. If history has taught us anything it is that the lines separating socialist uprisings from fascist popularity are not as clear as we may like to think. Political movements often thrive on the charisma of their leaders and their ability to build a narrative that chimes with the misery or discontent of the public. In Germany’s broken socioeconomic structure of the 1920’s it could easily have been the communists who came to power on a wave of popular support instead of the National Socialists. But the Nazis were more adept at political maneuvering and public manipulation. One of the many lessons available from this episode however is that most individuals are not remotely concerned with political ideology. Instead they back parties that offer the best guarantee of personal and collective security. This security can and does take many shapes, but it is the desire to protect one’s self and one’s security that is at the core of electoral and public decision-making. But electoral decisions are also often made with rejection in mind – rejection of the incumbent political force and policies. Under these circumstances, a clear and workable alternative vision matters less, since the public desire to oust those who have led them into darker times will often be sufficient to create political change. This is the predominant theme in modern politics and since voters are often hard pressed to identify the core differences between candidates, a vote for one is largely just a rejection of the other. But the current wave of demonstrations across Europe is about something greater than electoral choice, it represents a rejection of modern politics. The SNP, UKIP and the Catalan nationalists may promote very different ideals but all try to tap into the disenchantment of voters in the face of globalised, neoliberal politics administered from a distant centre of power. All seek to recapture a real or imaginary notion of local identity from the clutches of external bureaucratic institutions. All offer a vision of the future which appeals to those who want a greater say in shaping their local culture and society. As citizens feel increasingly distant from the centre of power they strive to have a greater say in organising their communities in a way which is consistent with their own beliefs and identity rather than those of policymakers in London, Madrid or Brussels. The psychologist, Joshua Searle-White, has investigated the psychology behind nationalist movements and asserts that nationalists are people who “carry strong attitudes and beliefs about their own people and about others, who feel their attachment to their nation passionately, and who even, at times, act with great cruelty against their enemies.” In other words, nationalism is a strong unifier in offering people the opportunity to identify with a group. This group mentality traditionally brings a sense of security of not being alone in one’s beliefs, and also the strong sense of identify which arises from being a part of a collective. But the identity component comes with both positive (ie. I am Catalan) and negative (I am not Spanish) reinforcement. Nationalism therefore fosters an insiders vs. outsiders mentality. By being a part of one group I have consciously excluded myself from belonging to a rival group. The causality in this relationship runs both ways. Nationalism can offer the basis of the insiders vs. outsiders mentality, but the feeling of being an outsider can also motivate people towards joining movements where they can find the sense of identity and inclusion they desire. And when these sentiments are unleashed, and the momentum of the group grows, it then becomes impossible to isolate the psychology, politics or sociology that underpins the motivations of its members. So the question is this: could there be other factors other than nationalism that have given such a considerable boost to Scottish and Catalan independence movements in recent years? Before answering this question it makes sense to look cast the net a little wider in search of other popular movements which have sprung to prominence in recent years. Greece has dominated the headlines in recent weeks as Syriza surged to a comprehensive electoral victory. This was a crushing rejection of the existing political order by the Greek people. No longer, they said, would they be held hostage to institutional and financial power emanating from beyond Greek borders. The Greeks had voiced a desire to be masters of their own destiny (as far as could be allowed within the existing global bureaucracy). Although Syriza has steadily been forced to give ground on its electoral promises since taking office, the popular sentiments of the Greek people have already been unleashed and Greece no longer seems content to be a member of the Euro insiders at any cost. To paraphrase Trotsky, the country has so radically vomited up austerity that it cannot ever crawl down the people’s throat again. But it is not just the politics of austerity that has so angered the Greek electorate; it is the realisation that Greek society and Greek principles are not necessarily the same as those in Brussels or Frankfurt. It is the manifestation of the collective understanding that the Greek people no longer identify with the model of European integration that has been forced upon them. Moving beyond merely austerity we can then look at this situation in terms of a battle to regain national pride and identity. Under these terms, it mirrors the nationalist movements in the UK and Catalunya. 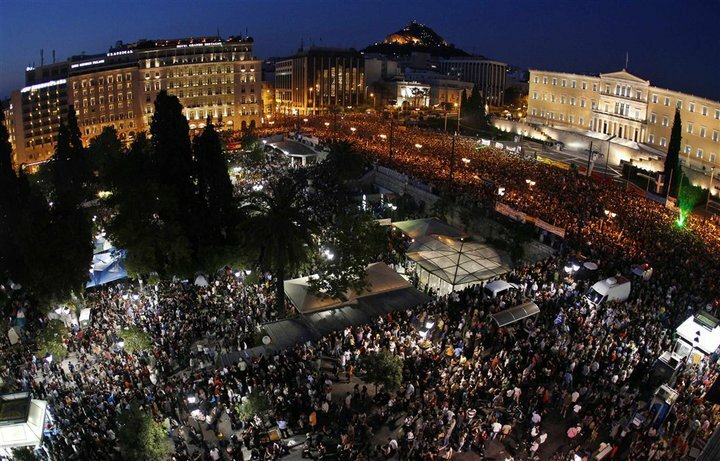 The Greek protests are the latest frontier of the insiders vs. outsiders debate that is sweeping across the continent. That it has sprung to prominence on the back of the anti-austerity stance pushed by the new government is a matter as much of professional politics as it is of collective hatred of the infamous Troika. The reason why Syriza in Greece and Podemos in Spain have been so successful in bringing their left-wing political movements to the mainstage is that both have redefined the discussion of popular national politics. Both rightly rally against austerity but do so in a way that appeals to feelings of national pride rather than just economics. Moreover, Podemos in particular have attacked corruption and the ‘elite’ in order to play on feelings that a privileged few live large under government protection while the many toil daily to uphold the system which keeps them down. As Podemos leader Pablo Iglesias has often mentioned, it is the people vs. the establishment, or insiders vs. outsiders. The parallel can therefore be drawn once again between many of Europe’s other popular movements for change. But, we may ask, why has this political narrative come to the fore so successfully in some countries but not others? In some ways, the roots of the answer can be found in a series of studies carried out in the 70’s by two sociologists. Piven and Cloward looked at what they called, ‘poor people’s movements’ to try to understand why some protests succeed and others fail. They pointed out that as poor people lack the resources to mount an effective movement for change, their only tool is social disruption. But even this is limited in its application by structural features in society. However, in moments of political and economic crisis these structural features are weakened, and when this occurs there is a limited opportunity for effective protest. Timing therefore is crucial to the success of protest arising from street-level. But timing is not all, and it is Piven and Cloward’s individual case studies that are most revealing. Where many poor people’s movements failed it was because their leadership eventually turned away from aggressive confrontation with ruling authorities and instead chose to work ‘within the system’. When this happens, movements lose their mass base, and with it their only real weapon to fight for change. While the leadership argues for change within the system, the system’s momentary crisis passes and the opportunity for change slips away. When, according to Piven and Cloward, these types of movements have achieved some measure of success, however, they have shared two particular traits: they focus on a very small number of core demands or issues, and they are successful in keeping their participants motivated to protest by sticking to the core narrative. Trying to influence the controlling establishment through lobbying results in failure, but mass protest where the participants feel they have a strong individual role to play, and where the core demands are few in number, can yield success. Although the current protests throughout Europe are much wider than those discussed by Piven and Cloward, they have much to learn from this historical analysis. 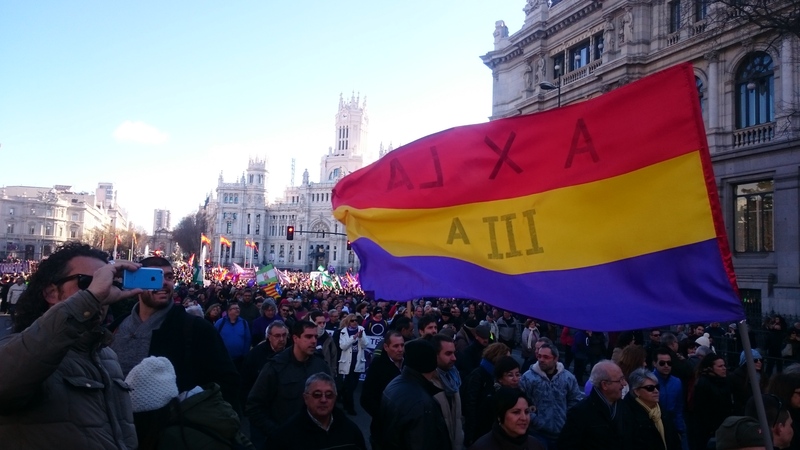 Podemos has succeeded in Spain because they have brought people to the streets and focused their argument around two core issues: corruption and austerity. In Portugal, Left Bloc has failed because it has been too broad in its public manifesto and so has failed to capture the popular imagination and create a platform for mass social protest. Likewise, in Greece, Syriza’s core demands are tightly focused on the evils of Troika policy, rather than the wider ideologies normally seen from left-wing coalitions. But both Syriza and Podemos are reaching a crossroads where they must decide whether they are to represent the outsiders or whether they are to influence the insiders from within the system. Discontent is already emerging within Syriza about its apparent climb-down in the face of the demands of Greece’s creditors. Podemos too has seen allegations that it is moving away from some of the harder left-wing policies that were fundamental to its original manifesto. Both parties have found success in bringing their supporters to the street and offering them a voice in national politics. But both now risk losing their support base by being too ready to compromise in order to cement political power. For nationalist movements the issues are far clearer. There is so little room for compromise on the core principles that the SNP, UKIP and the Catalan nationalists campaign on that they need not worry about their support dwindling as a result of a change in party stance. All, however, are surely aware that their success is subject to the temporal limitations discussed by Piven and Cloward. In a moment of true crisis in the capitalist system, the groundwork is laid for political movements to capitalise on public discontent and rally the people behind the banner of national and personal pride. But as the ruling classes work to repair the damage to their institutions and structures, the window of opportunity for true change will be gradually closed. Popular protests throughout Europe are tied together by a growing feeling of marginalisation among the working classes. Whether the ‘enemy’ is supposed to be bureaucrats, immigrants, the ‘caste’, the Troika, or the central government, it is identity, equality and representation that are really at the root of most contemporary protests. The people have realised that they are increasingly becoming prisoners of distant, arbitrary institutional power. That this power exercises its authority in the name of capital rather than in the name of the people has been laid bear for all to see. What we are witnessing is not a series of campaigns based on discrete national interests but the battle lines in 21st century class warfare. These are not classes in a Marxian sense since the working class are no longer strictly defined by their labour. Instead, the division is based around people vs. the establishment; insiders vs. outsiders; those who wish to uphold community values vs. those who wish them to be subservient to international finance and commerce; those who want a democratic voice for change vs. those who thrive under the status quo; those who create value through their labour vs. those who manipulate the system to the benefit of rent-seeking activity; centralised power vs. democratic, localised representation. The true enemy is the neoliberal agenda exported via aggressive hyperglobalisation. Towards the end of the 20th century, as free trade was finally joined by free movement of capital throughout the western world, countries came under increasing political pressure to ensure that ‘hot’ money could flow from the lowest cost source to the highest return destination. Despite the damage done by unregulated capital flows in Asia and Latin America in the 1990’s, the prevailing narrative of neoliberalism has been that capital markets work best when they are unrestricted. And with this soulless ideology firmly entrenched in the corridors of power, national, local and individual concerns have been trampled under a stampede of market fanaticism. As luck would have it, with the expansion of the European integration project, this neoliberal vision has found itself a group of powerful institutional partners. The true opponent of popular movements in Spain, Greece, England, Scotland and beyond is the latest version of globalisation, or pan-European ‘integration’ that rides roughshod of the rights of workers, families and communities. People are demanding democracy, participation, social justice, equality, and a return to more traditional values. The modern European manifestations of nationalism and socialism are linked by their desire to reclaim society from the clutches of global market forces. In the post 2008-world, Varoufakis was trying to explain the problems inherent in a capitalist system that turns human beings and their labour into commodities. In the few years that have passed since, it has become ever clearer that it is not just the corporations that try to commodify humans to make them subservient to capitalism, it is the global institutions and governments that champion the neoliberal agenda. At this critical juncture in the evolution of capitalism, the moment of change has arrived. Syriza currently offers the most immediate possibility of change within Europe but the news of the Greek bailout extension suggests that they are preparing to work within the system rather then demand real reform. If they can stay in power until later in the year they may be joined on the international stage by Pablo Iglesias and Podemos in Spain. Perhaps then we may see a united front in fighting austerity and European neoliberalism. In UK politics there is a void on the left waiting to be filled by a party that promotes a different vision of the future and that offers a positive voice to those who would otherwise flock to UKIP. Although we will not see such a movement in time for the general election, the left should still be vocal in supporting its ideological partners across Europe. 2015 looks set to be a defining year in European politics and society. As history suggests, now is not the time for doubts and compromise. I like this analysis. We see the same flows in Sweden where the Swedish Democrats have fought their way to a place at the table. I think of timelines, when exactly does anti-establishment cross over the line and become establishment? I find myself doing a lot of reading outside of my normal parameters. Following Syriza and what can only be seen as a anti-climax…(more of the same or all mouth no action). I had my hopes up. I have heard “I told you so” a number of times now!